Often times we hear the word “arborist” and don’t know exactly what that entails. We know that we need lawn care and tree experts to work on our yard, but aren’t sure exactly what certification or qualifications a person or company needs in order to get the job done right, efficiently, and reliably. Certified arborists are knowledgeable about trees and know how to use resources and equipment that will preserve the life, appearance, and health of your trees. If you hire an experienced and trustworthy arborist, your trees will see substantial improvements, or if you need a technical removal service, it will be done quickly and safely. 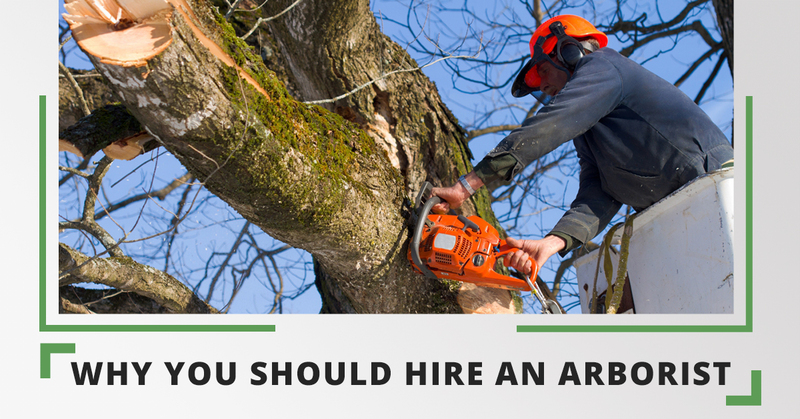 In this blog, we’re going to talk about some of the services you can expect to get out of your local, certified arborist. ISA or the International Society of Arboriculture is a nongovernmental certification that shows an arborist’s experience and knowledge in the field. This program is designed to qualify a person for work as an arborist, training students in utility, municipal work, climbing, aerial lifts, and general arborist knowledge. When you hire a certified arborist, you’re hiring someone who not only has experience in the field but has been through an extensive training program designed to prepare them for whatever issue may arise in the tree care process. Pruning: Pruning is an important process for maintaining the health, appearance, and safety of your trees. An arborist will be able to quickly identify what pruning needs to be done and execute it in a timely manner so that you don’t have to worry about your tree’s health throughout the year. Tree Removal: Many people try to remove stumps or trees by themselves, without the help of the expert. Not only is this dangerous, but it will take a lot longer than hiring a specialist who has the equipment and knowledge necessary for even the most challenging of technical removals. Emergency tree care: If your yard has been overwhelmed by disease or you need relief after a storm or high winds, arborists are here to take care of your trees while looking out for your safety. These situations can be nerve-racking because you never know what the potential risks are to your property and to your own health. It’s important to call a certified arborist immediately. Planting: Planting trees is an important aspect of being an arborist. An arborist will know which species should be planted in a specified area for increased life and to prevent disease or obstruction on your property. Plant health care: Reducing insect, disease, or site issues will help promote healthy trees in your yard. More: These are just some of the many services an arborist will offer. Most arborist companies offer free professional consultation that will provide you with advice and an idea of how much it will cost to have your trees worked on. Don’t hesitate to contact us today if you need tree care services. We’re proud to offer the highest quality services in the industry and won’t cut corners when it comes to helping you maintain a healthy, beautiful, and safe yard that everyone will enjoy!